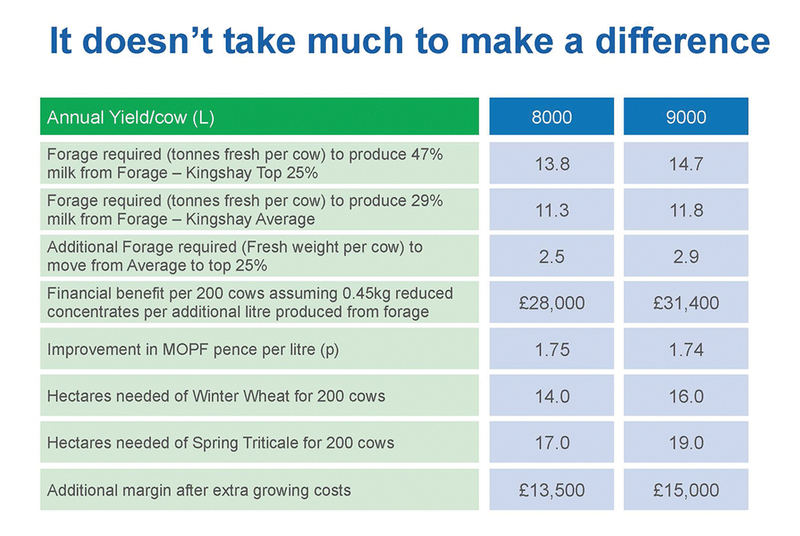 The flexibility of wholecrop is being used to help overcome seasonal shortcomings in other forages and restore some lost milk margin. Peter Hollinshead reports. That is the uncompromising message from Biotal’s technical support manager Roy Eastlake who believes that relying purely on grass silage and maize is potentially both risky and inflexible. Speaking at a London press briefing to release the results of last year’s wholecrop trials held at Harper Adams University, he cited Kingshay figures which showed the top 25% in the milk from forage stakes were taking 47% milk from forage against the average taking 29%. 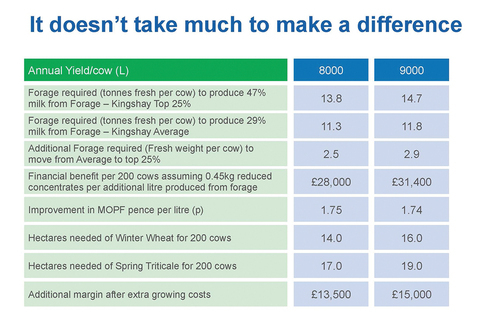 This showed for the 8000- litre cow, an additional 2.5tFW forage would be needed to go from average to top quartile, and this would result in an improvement in MOPF of 1.75ppl or a 200-cow additional margin of £13,500 after crop growing costs. 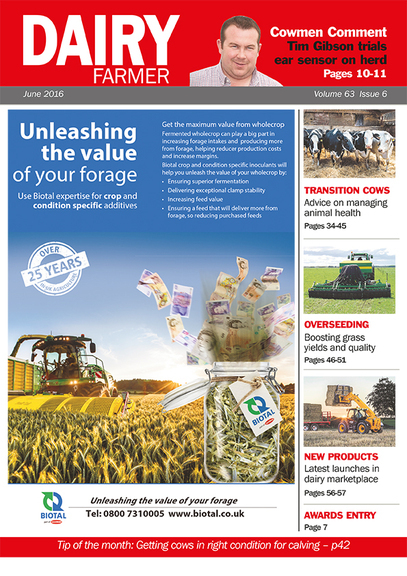 He stressed such an approach demands a change in thinking and producers needed to develop their own strategy, but he said too many had grown accustomed to relying on concentrates rather than fully exploiting forage-based diets. He said by varying the harvest date, farmers could react to the season as it unfolds, with the crop harvested later for high starch levels to complement a poor maize crop or cut early to compensate for poor quality grass silage giving less starch but more digestible fibre. Not only that, but it allowed harvest in the summer months rather than late autumn days as for maize when there was every possibility of wet ground. Releasing the first results of the trials at Harper Adams, he cited the figures for winter wheat and spring triticale and how their characteristics changed throughout the season depending on harvest date. The figures showed winter wheat’s variable production costs were £1053/ha (£425/acre) and over the five weekly sampling period DM yield went from 11.16 to 20.51t DM/ha. Over that same period DM went from 22.51% to 55.29%, D values went from 61.0 to 66.5, starch went from zero to 25.2%, and NDF from 60.9% to 43.4. 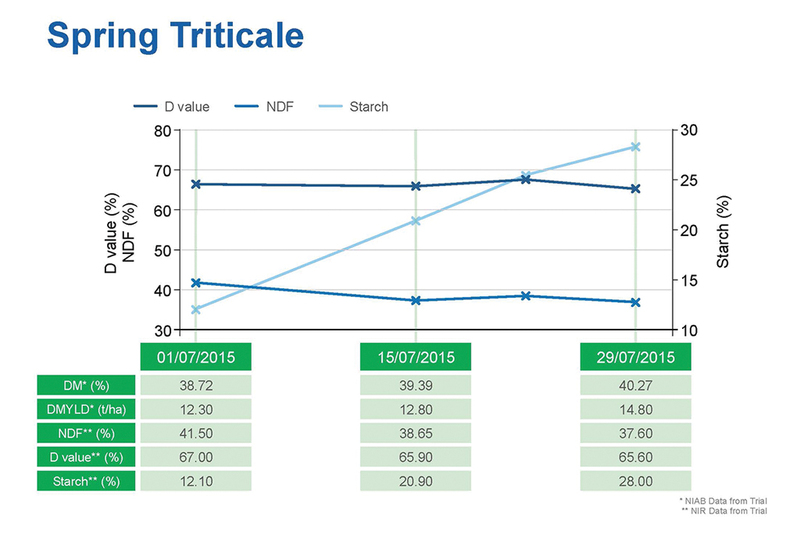 For spring triticale, production costs were somewhat less at £832/ha (£342/acre), with DM yields going from 12.31t DM/ha to 14.62 over the five-week sampling period, and DM percents from 38.72 to 44.54%. This analysed at 67.0 D value at week one and 65.9 at week 5, starch 12.1 and 28.1% respectively, and NDF 41.5% to 39.6%. 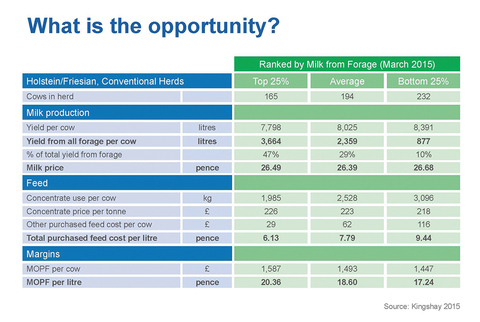 As regards the slightly lower ME of wholecrop, Mr Eastlake said this was not necessarily a big disadvantage as it enhances the openness and palatability of the diet and in practical conditions this could lead to increased intakes of around 6kg FW per day. “If you have grass silage alone the cows eat so much, if you have grass silage and maize they eat a bit more, but if you have all three they will eat even more and that is well documented,” he said. On the question of possibly a reduced energy density of the diet when wholecrop was included, he countered by saying “it is the amount consumed that is going to drive energy intake and not the density”. He went on to say that the better forage structure of wholecrop leads to better rumen efficiency. Spring cereals also gave fairly consistent production and did not display the same variation as maize and to some extent grass as well. It was also claimed that the introduction of wholecrop into the rations will raise the rumen pH which should reduce the incidence of sub-clinical acidosis. But, in addition to the nutritional aspects, he stressed the reliability and flexibility of wholecrop as it could be cut at a stage to best complement the other forages, which in turn allowed that profit driver of milk from forage to be boosted. “We’re not saying wholecrop is better than maize or better than grass, but all three together lead to a reduction in risk,” he stressed.